William Pitt, 1st Earl of Chatham PC (November 15, 1708 – May 1, 1778) was a British Whig statesman who achieved his greatest fame as Secretary of State during the Seven Years' War that was fought between France and Great Britain, (known as the French and Indian War in North America), and who was later Prime Minister of Great Britain. He is often known as William Pitt the Elder to distinguish him from his son, William Pitt the Younger, who served as Prime Minister from 1783–1801 and from 1804 to his death in 1806 . The major American city of Pittsburgh was named for him. Also, Pittsylvania County, Virginia, the smaller community of Pittsburg, New Hampshire and Chatham University (since he was Earl of Chatham) are named in his honor. Chatham, New Jersey is also named after him. Although he was only Prime Minister for two years, he was a dominant political figure throughout the eighteenth century. Many of his most significant achievements came before he occupied the highest office. He is credited with "the birth of the British Empire", which made him very popular with the general public, who dubbed him "The Great Commoner" . He was responsible for territorial expansion in Canada, India, the West Indies and West Africa. He was effectively prime minister "throughout the earlier premierships of Devonshire and the Earl of Newcastle" . His popularity declined when he accepted a peerage. Yet in many respects he can be considered as the architect of the Britain that be one of the major powers in the world through until the end of the Second World War and of the Empire on which it was said that "the sun never sets", the largest Empire the world has known. An ambitious and often manipulative man, he sometimes worked for his own advancement rather than for the public good. Pitt was born at Westminster. He was the younger son of Robert Pitt of Boconnoc, Cornwall, and grandson of Thomas Pitt (1653–1726), governor of Madras, who was known as "Diamond" Pitt because he sold a Regent diamond of extraordinary size to the Regent Orléans for around £135,000. It was mainly by this fortunate transaction that the governor was enabled to raise his family, which was one of old standing, to a position of wealth and political influence. The latter he acquired by purchasing the burgage tenures of the rural area called Old Sarum, in Salisbury, a district which had representation in Parliament, but no residents in need of representation. William Pitt was educated at Eton, and, in January 1727, was entered as a gentleman commoner at Trinity College, Oxford. There is evidence that he was an extensively read, if not a minutely accurate classical scholar; and it is noteworthy that Demosthenes was his favorite author, and that he diligently cultivated the faculty of expression by the practice of translation and re-translation. A hereditary gout, from which he had suffered even during his school-days, compelled him to leave the university without taking his degree, in order to travel abroad. He spent some time in France and Italy, but the disease proved intractable, and he continued subject to attacks of growing intensity at frequent intervals until the close of his life. In 1727 his father had died, and on his return home, it was necessary for him as the younger son to choose a profession. Having chosen the army, he obtained, through the interest of his friends, a cornet's commission in the dragoons. George II never forgot the jibes of 'the terrible cornet of horse'. But his military career was destined to be short. His elder brother Thomas having been returned at the general election of 1734 both for Oakhampton and for Old Sarum, and having preferred to sit for the former, the family borough fell to the younger brother by the sort of natural right usually recognized in such cases. Accordingly, in February 1735, William Pitt entered parliament as member for the "rotten borough" of Old Sarum. Attaching himself at once to the formidable band of discontented Whigs, known as the Patriots, whom Walpole's love of exclusive power had forced into opposition under Pulteney, Pitt became in a very short time one of its most prominent members. His maiden speech was delivered in April 1736, in the debate on the congratulatory address to King George II on the marriage of Frederick, Prince of Wales. The occasion was one of compliment, and there is nothing striking in the speech as reported; but it served to gain for him the attention of the house when he presented himself, as he soon afterwards did, in debates of a party character. So obnoxious did he become as a critic of the government, that Walpole thought fit to punish him by procuring his dismissal from the army. Some years later, he had occasion vigorously to denounce the system of cashiering officers for political differences, but with characteristic loftiness of spirit he disdained to make any reference to his own case. The loss of his commission was soon made up to him. The heir to the throne, as was usually the case in the House of Hanover, if not in reigning families generally, was the patron of the parliamentary opposition, and the ex-cornet became "groom of the bed-chamber" to Prince Frederick. In this new position, his hostility to the government did not, as may be supposed, in any degree relax. He had all the natural gifts an orator could desire—a commanding presence, a graceful though somewhat theatrical bearing, an eye of piercing brightness, and a voice of the utmost flexibility. His style, if occasionally somewhat turgid, was elevated and passionate, and it always bore the impress of that intensity of conviction which is the most powerful instrument a speaker can have to sway the convictions of an audience. It was natural, therefore, that in the series of stormy debates, protracted through several years, that ended in the downfall of Walpole, his eloquence should have been one of the strongest of the forces that combined to bring about the final result. 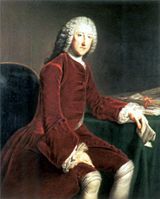 In 1742, Walpole was at last forced to succumb to the long-continued attacks of opposition, and was succeeded as Prime Minister by Lord Wilmington, though the real power in the new government was divided between Lord Carteret and the Pelham brothers (Henry and Thomas, Duke of Newcastle-upon-Tyne). Pitt's conduct on the change of administration was open to grave censure. The relentless vindictiveness with which he insisted on the prosecution of Walpole, and supported the bill of indemnity to witnesses against the fallen minister, was in itself not magnanimous; but it appears positively unworthy when it is known that a short time before Pitt had offered, on certain conditions, to use all his influence in the other direction. Possibly, he was embittered at the time by the fact that, owing to the strong personal dislike of the king, caused chiefly by the contemptuous tone in which he had spoken of Hanover, he did not by obtaining a place in the new ministry reap the fruits of the victory to which he had so largely contributed. The so-called "broad-bottom" administration formed by the Pelhams in 1744, after the dismissal of Carteret, though it included several of those with whom he had been accustomed to act, did not at first include Pitt himself even in a subordinate office. Before the obstacle to his admission was overcome, he had received a remarkable accession to his private fortune. When the Dowager Duchess of Marlborough died in 1744, at the age of eighty four, she left him a legacy of £10,000 as an "acknowledgment of the noble defence he had made for the support of the laws of England and to prevent the ruin of his country". As her hatred was known to be at least as strong as her love, the legacy was probably as much a mark of her detestation of Walpole as of her admiration of Pitt. It may be mentioned here, though it does not come in chronological order, that Pitt was a second time the object of a form of acknowledgment of public virtue which few statesmen have had the fortune to receive even once. About twenty years after the Marlborough legacy, Sir William Pynsent, a Somerset baronet to whom he was personally quite unknown, left him his entire estate, worth about three thousand a year, in testimony of approval of his political career. It was with no very good grace that the king at length consented to give Pitt a place in the government, although the latter did all he could to ingratiate himself at court, by changing his tone on the questions on which he had made himself offensive. To force the matter, the Pelhams had to resign expressly on the question whether he should be admitted or not, and it was only after all other arrangements had proved impracticable, that they were reinstated with the obnoxious politician as vice-treasurer of Ireland. This was in February 1746. In May of the same year, he was promoted to the more important and lucrative office of Paymaster of the paymaster-general, which gave him a place in the privy council, though not in the cabinet. Here he had an opportunity of displaying his public spirit and integrity in a way that deeply impressed both the king and the country. It had been the usual practice of previous paymasters to appropriate to themselves the interest of all money lying in their hands by way of advance, and also to accept a commission of 1/2 percent on all foreign subsidies. Although there was no strong public sentiment against the practice, Pitt altogether refused to profit by it. All advances were lodged by him in the Bank of England until required, and all subsidies were paid over without deduction, even though it was pressed upon him, so that he did not draw a shilling from his office beyond the salary legally attaching to it. Conduct like this, though obviously disinterested, did not go without immediate and ample reward, in the public confidence which it created, and which formed the mainspring of Pitt's power as a statesman. The administration formed in 1746 lasted without material change until 1754. It would appear from his published correspondence that Pitt had a greater influence in shaping its policy than his comparatively subordinate position would in itself have entitled him to. His conduct in supporting measures, such as the Spanish treaty and the continental subsidies, which he had violently denounced when in opposition, had been much criticized; but within certain limits, not indeed very well defined, inconsistency has never been counted a vice in an English statesman. The times change, and he is not blamed for changing with the times. Pitt in office, looking back on the commencement of his public life, might have used the plea "A good deal has happened since then," at least as justly as some others have done. Allowance must always be made for the restraints and responsibilities of office. In Pitt's case, too, it is to be borne in mind that the opposition with which he had acted gradually dwindled away, and that it ceased to have any organized existence after the death of the prince of Wales in 1751. Then in regard to the important question with Spain as to the right of search, Pitt has disarmed criticism by acknowledging that the course he followed during Walpole's administration was indefensible. All due weight being given to these various considerations, it must be admitted, nevertheless, that Pitt did overstep the limits within which inconsistency is usually regarded as venial. His one great object was first to gain office, and then to make his tenure of office secure by conciliating the favor of the king. The entire revolution which much of his policy underwent in order to effect this object bears too close a resemblance to the sudden and inexplicable changes of front habitual to placemen of the Tadpole stamp to be altogether pleasant to contemplate in a politician of pure aims and lofty ambition. Humiliating is not too strong a term to apply to a letter in which he expresses his desire to "efface the past by every action of his life," in order that he may stand well with the king. In 1754, Henry Pelham died, and was succeeded at the head of affairs by his brother, the Duke of Newcastle-upon-Tyne. To Pitt, the change brought no advancement, and he had thus an opportunity of testing the truth of the description of his chief given by Sir Robert Walpole, "His name is treason." But there was for a time no open breach. Pitt continued at his post; and at the general election which took place during the year he even accepted a nomination for the duke's pocket borough of Aldborough, North Yorkshire|Aldborough. He had sat for Seaford since 1747. When Parliament met, however, he was not long in showing the state of his feelings. Ignoring Sir Thomas Robinson, 1st Baron Grantham|Thomas Robinson, the political nobody to whom Newcastle had entrusted the management of the Commons, he made frequent and vehement attacks on Newcastle himself, though still continuing to serve under him. In this strange state matters continued for about a year. At length, just after the meeting of parliament in November 1751, Pitt was dismissed from office, having on the debate on the address spoken at great length against a new system of continental subsidies, proposed by the government of which he was a member. Henry Fox, who had just before been appointed Secretary of State, retained his place, and though the two men continued to be of the same party, and afterwards served again in the same government, there was henceforward a rivalry between them, which makes the celebrated opposition of their illustrious sons seem like an inherited quarrel. Another year had scarcely passed when Pitt was again in power. The inherent weakness of the government, the vigor and eloquence of his opposition, and a series of military disasters abroad combined to rouse a public feeling of indignation which could not be withstood, and in December 1756 Pitt, who now sat for Okehampton, became Secretary of State for the Southern Department, and Leader of the House of Commons under the premiership of the Duke of Devonshire. Upon entering this coalition, Pitt said to Devonshire: "My Lord, I am sure I can save this country, and no one else can". He had made it a condition of his joining any administration that Newcastle should be excluded from it, thus showing a resentment which, though natural enough, proved fatal to the lengthened existence of his government. With the king unfriendly, and Newcastle, whose corrupt influence was still dominant in the Commons, estranged, it was impossible to carry on a government by the aid of public opinion alone, however emphatically that might have declared itself on his side. The historian Basil Williams has claimed that this is the first time in British history when a "man was called to supreme power by the voice of the people" rather than by the king's appointment or as the choice of Parliament. For some weeks it rained gold boxes: Chester, Worcester, Norwich, Bedford, Salisbury, Yarmouth, Tewkesbury, Newcastle-on-Tyne, Stirling, and other populous and chief towns following the example. Exeter, with singular affection, sent boxes of oak. From the political deadlock that ensued relief could only be had by an arrangement between Newcastle and Pitt (called "Broad Bottom Government"). After some weeks' negotiation, in the course of which the firmness and moderation of "The Great Commoner", as he had come to be called, contrasted favorably with the characteristic tortuosities of the crafty peer, matters were settled on such a basis that, while Newcastle was the nominal head, Pitt was the virtual head of the government. On his acceptance of office, he was chosen member for Bath, Somerset. A coalition with Newcastle was formed in June 1757, and continued in power until 1761. During the four years of its existence, it has been usual to say that the biography of Pitt is the history of England, so thoroughly was he identified with the great events which make this period, in so far as the external relations of the country are concerned, one of the most glorious in her annals. A detailed account of these events belongs to history; all that is needed in a biography is to point out the extent to which Pitt's personal influence may really be traced in them. It is scarcely too much to say that, in the general opinion of his contemporaries, the whole glory of these years was due to his single genius; his alone was the mind that planned, and his the spirit that animated the brilliant achievements of the British arms in all the four quarters of the globe. The London Magazine of 1766 offered 'Pitt, Pompadour, Prussia, Providence' as the reasons for Britain's success in the Seven Years' War. Posterity, indeed, has been able to recognize more fully the independent genius of those who carried out his purposes. The heroism of Wolfe would have been irrepressible, Clive would have proved himself "a heaven-born general," and Frederick the Great would have written his name in history as one of the most skillful strategists the world has known, whoever had held the seals of office in England. But Pitt's relation to all three was such as to entitle him to a large share in the credit of their deeds. He inspired trust in his chosen commanders by his indifference to rules of seniority — several of 'Pitt's boys', like Keppel, captor of Gorée, were in their thirties — and by his clear orders. It was his discernment that selected Wolfe to lead the attack on Quebec, and gave him the opportunity of dying a victor on the Plains of Abraham|heights of Abraham. He had personally less to do with the successes in India than with the other great enterprises that shed an undying lustre on his administration; but his generous praise in parliament stimulated the genius of Clive, and the forces that acted at the close of the struggle were animated by his indomitable spirit. But material aggrandisement, though the only tangible, is not the only real or lasting effect of a war policy. More may be gained by crushing a formidable rival than by conquering a province. The loss of her Canadian possessions was only one of a series of disasters suffered by France, which included the victories at sea of Boscawen at Lagos and Hawke at Quiberon Bay. Such defeats radically affected the future of Europe and the world. Deprived of her most valuable colonies both in the East and in the West, and thoroughly defeated on the continent, her humiliation was the beginning of a new epoch in history. The victorious policy of Pitt destroyed the military prestige which repeated experience has shown to be in France as in no other country the very life of monarchy, and thus was not the least considerable of the many influences that slowly brought about the French Revolution. It effectually deprived her of the lead in the councils of Europe which she had hitherto arrogated to herself, and so affected the whole course of continental politics. It is such far-reaching results as these, and not the mere acquisition of a single colony, however valuable, that constitute Pitt's claim to be considered as on the whole the most powerful minister that ever guided the foreign policy of England. The first and most important of a series of changes which ultimately led to the dissolution of the ministry was the death of George II on October 25, 1760, and the accession of his grandson, George III. The new king was inclined to view politics in personal terms and taught to believe that 'Pitt had the blackest of hearts'. As was natural, the new king had counsellors of his own, the chief of whom, Lord Bute, was at once admitted to the cabinet as a Secretary of State. Between Bute and Pitt there speedily arose an occasion of serious difference. The existence of the so-called family compact by which the Bourbons of France and Spain bound themselves in an offensive alliance against England was suspected; Pitt urged that it should be met by a preemptive strike against Spain's navy and her colonies. To this course Bute would not consent, and as his refusal was endorsed by all his colleagues save Richard Grenville-Temple, 2nd Earl Temple, Pitt had no choice but to leave a cabinet in which his advice on a vital question had been rejected: "Being responsible, I will direct, and will be responsible for nothing that I do not direct." On his resignation, which took place in October 1761, the King urged him to accept some signal mark of royal favor in the form most agreeable to himself. Accordingly he obtained a pension of £3000 a year for three lives, and his wife, Lady Hester Grenville, whom he had married in 1754, was created Earl of Chatham|Baroness Chatham in her own right. In connexion with the latter gracefully bestowed honour it may be mentioned that Pitt's domestic life was a singularly happy one. Pitt's spirit was too lofty to admit of his entering on any merely factious opposition to the government he had quitted. On the contrary, his conduct after his retirement was distinguished by a moderation and disinterestedness which, as Edmund Burke|Burke has remarked, "set a seal upon his character." The war with Spain, in which he had urged the cabinet to take the initiative, proved inevitable; but he scorned to use the occasion for "altercation and recrimination," and spoke in support of the government measures for carrying on the war. To the preliminaries of the Treaty of Paris (1763) he offered an indignant resistance, considering the terms quite inadequate to the successes that had been gained by the country. When the treaty was discussed in parliament in December of the preceding year, though suffering from a severe attack of gout, he was carried down to the House, and in a speech of three hours' duration, interrupted more than once by paroxysms of pain, he strongly protested against its various conditions. These conditions included the return of the sugar islands (but Britain retained Dominica); trading stations in West Africa (won by Boscawen); [ondicherry, (France's Indian colony); and fishing rights in Newfoundland. Pitt's opposition arose through two heads: France had been given the means to become once more formidable at sea, whilst Frederick had been betrayed. However, there were strong reasons for concluding the peace: the National Debt had increased from £74.5m. in 1755 to £133.25m. in 1763, the year of the Treaty of Paris (1763). The requirement to pay down this debt, and the lack of French threat in Canada, were major movers in the subsequent American War of Independence. The physical cause which rendered this effort so painful probably accounts for the infrequency of his appearances in parliament, as well as for much that is otherwise inexplicable in his subsequent conduct. In 1763 he spoke against the obnoxious tax on cider, imposed by his brother-in-law, George Grenville, and his opposition, though unsuccessful in the House, helped to keep alive his popularity with the country, which cordially hated the excise and all connected with it. When next year the question of general warrants was raised in connexion with the case of John Wilkes, Pitt vigorously maintained their illegality, thus defending at once the privileges of Parliament and the freedom of the press. During 1765 he seems to have been totally incapacitated for public business. In the following year he supported with great power the proposal of the Charles Watson-Wentworth, 2nd Marquess of Rockingham|Rockingham administration for the repeal of the American Stamp Act, arguing that it was unconstitutional to impose taxes upon the colonies. He thus endorsed the contention of the colonists on the ground of principle, while the majority of those who acted with him contented themselves with resisting the disastrous taxation scheme on the ground of expediency. The Repeal Act, indeed, was only passed pari passu with another censuring the American Deliberative assemblies, and declaring the authority of the British parliament over the colonies "in all cases whatsoever"; so that the House of Commons repudiated in the most formal manner the principle Pitt laid down. His language in approval of the resistance of the colonists was unusually bold, and perhaps no one but himself could have employed it with impunity at a time when the freedom of debate was only imperfectly conceded. Pitt had not been long out of office when he was solicited to return to it, and the solicitations were more than once renewed. Unsuccessful overtures were made to him in 1763, and twice in 1765, in May and June - the negotiator in May being the king's uncle, the Duke of Cumberland, who went down in person to Hayes, Pitt's seat in Kent. It is known that he had the opportunity of joining the Marquis of Rockingham's short-lived administration at any time on his own terms, and his conduct in declining an arrangement with that minister has been more generally condemned than any other step in his public life. In July 1766 Rockingham was dismissed; and Pitt was entrusted by the King with the task of forming a government entirely on his own conditions. The result was a cabinet, strong much beyond the average in its individual members, but weak to powerlessness in the diversity of its composition. Burke, in a memorable passage of a memorable speech, has described this "chequered and speckled" administration with great humor, speaking of it as "patriots and courtiers, King's friends and republicans; Whigs and Tories… indeed a very curious show, but utterly unsafe to touch and unsure to stand on." Pitt chose for himself the office of Lord Privy Seal, which necessitated his removal to the House of Lords; and in August he became Earl of Chatham and Viscount Pitt. His principle, 'measures not men', appealed to the King whom he proposed to serve by 'destroying all party distinctions'. The problems which faced the government he seemed specially fitted to tackle: the observance of the Treaty of Paris by France and Spain; tension between American colonists and the mother country; and the status of the East India Company. Choosing for himself freedom from the routines of office, as Lord Privy Seal he made appointments without regard for connections but perceived merit: Charles Townshend to the Exchequer; and William Petty, 2nd Earl of Shelburneas, Secretary of State, to order American affairs. He set about his duties with tempestuous energy. Yet in October 1768 he resigned after a catastrophic ministry, leaving such leadership as he could give to Augustus FitzRoy, 3rd Duke of Grafton his First Lord of the Treasury. What had gone wrong? By the acceptance of a peerage, the great commoner lost at least as much and as suddenly in popularity as he gained in dignity. One significant indication of this may be mentioned. In view of his probable accession to power, preparations were made in the City of London for a banquet and a general illumination to celebrate the event. But the celebration was at once countermanded when it was known that he had become Earl of Chatham. The instantaneous revulsion of public feeling was somewhat unreasonable, for Pitt's health seems now to have been beyond doubt so shattered by his hereditary malady, that he was already in old age though only 58 years old. It was natural, therefore, that he should choose a sinecure office, and the ease of the Lords. But a popular idol nearly always suffers by removal from immediate contact with the popular sympathy, be the motives for removal what they may. One of the earliest acts of the new ministry was to lay an embargo upon cereal (corn), which was thought necessary in order to prevent a dearth resulting from the unprecedentedly bad harvest of 1766. 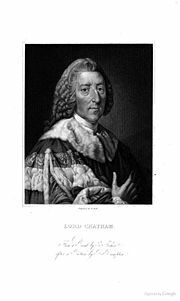 The measure was strongly opposed, and Lord Chatham delivered his first speech in the House of Lords in support of it. It proved to be almost the only measure introduced by his government in which he personally interested himself. Those who are able to read the history in the light of what occurred later may perhaps be convinced that no policy whatever initiated, after 1766 could have prevented or even materially delayed the United States Declaration of Independence; but to the politicians of that time the coming event had not yet cast so dark a shadow before as to paralyze all action, and if any man could have allayed the growing discontent of the colonists and prevented the ultimate dismemberment of the empire, it would have been Lord Chatham. For many months, things remained in the curious position that he who was understood to be the head of the cabinet had as little share in the government of the country as an unenfranchised peasant. As the chief could not or would not lead, the subordinates naturally chose their own paths and not his. The lines of Chatham's policy were abandoned in other cases besides the imposition of the import duty; his opponents were taken into confidence; and friends, such as Jeffrey Amherst, 1st Baron Amherst William Petty, 2nd Earl of Shelburne, were dismissed from their posts. When at length in October 1768 he tendered his resignation on the ground of shattered health, he did not fail to mention the dismissal of Amherst and Shelburne as a personal grievance. As he realized the gravity of the American situation, Chatham re-entered the fray, declaring that 'he would be in earnest for the public' and 'a scarecrow of violence to the gentler warblers of the grove'. They, moderate Whigs, found a prophet in Edmund Burke, who wrote of Chatham that he wanted 'to keep hovering in the air, above all parties, and to swoop down where the prey may prove best'. Such was Augustus FitzRoy, 3rd Duke of Grafton, victim of Chatham's swift swoop on behalf of 'Wilkes and Liberty'. Pitt had not lost his nose for the big issue, the smell of injustice, a threat to the liberty of subjects. But Grafton was followed by North, and Chatham went off to farm, his cows typically housed in palatial stalls. Chatham's warnings on America went unregarded until the eve of war. Then brave efforts to present his case, passionate, deeply pondered, for the concession of fundamental liberties - no taxation without consent, independent judges, trial by jury, along with the recognition of the Unites States Congress - foundered on the ignorance and complacency of Parliament. In his last years he found again words to express the concern for the rights of British subjects which had been constant among the inconsistencies of his political dealings. In January 1775. The House of Lords rejected his Bill for reconciliation. After war had broken out, he warned that America could not be conquered. He had now almost no personal following, mainly owing to the grave mistake he had made in not forming an alliance with the Rockingham party. But his eloquence was as powerful as ever, and all its power was directed against the government policy in the contest with America, which had become the question of all-absorbing interest. His final appearance in the House of Lords was on April 7, 1778, on the occasion of the Charles Lennox, the Duke of Richmond's motion for an address praying the king to conclude peace with America on any terms. In view of the hostile demonstrations of France, the various parties had come generally to see the necessity of such a measure. But Chatham could not brook the thought of a step which implied submission to the "natural enemy" whom it had been the main object of his life to humble, and he declaimed for a considerable time, though with sadly diminished vigor, against the motion. After the Duke of Richmond had replied, he rose again excitedly as if to speak, pressed his hand upon his breast, and fell down in a fit. His last words before he collapsed were: 'My Lords, any state is better than despair; if we must fall, let us fall like men.' James Harris MP, however, recorded that Robert Nugent, 1st Earl Nugent had told him that Chatham's last words in the Lords were: 'If the Americans defend independence, they shall find me in their way' and that his very last words (spoken to John Pitt, 2nd Earl of Chatham, his son) were: 'Leave your dying father, and go to the defence of your country'. He was removed to his seat at Hayes, where his son William read Homer to him: the passage about the death of Hector. Chatham died on May 11. With graceful unanimity all parties combined to show their sense of the national loss. The Commons presented an address to the king praying that the deceased statesman might be buried with the honors of a public funeral, and voted a sum for a public monument which was erected over his grave in Westminster Abbey. In the Guildhall Burke's inscription summed up what he had meant to the City: he was 'the minister by whom commerce was united with and made to flourish by war'. Soon after the funeral a bill was passed bestowing a pension of £4,000 a year on his successors in the earldom. He had a family of three sons and two daughters, of whom the second son, William, was destined to add fresh lustre to a name which is one of the greatest in the history of England. "Walpole was a minister given by the king to the people, but Pitt was a minister given by the people to the king,"
This remark correctly indicates Chatham's distinctive place among English statesmen. He was the first minister whose main strength lay in the support of the nation at large as distinct from its representatives in the Commons, where his personal following was always small. He was the first to discern that public opinion, though generally slow to form and slow to act, is in the end the paramount power in the state; and he was the first to use it not in an emergency merely, but throughout a whole political career. To the outside public he was endeared as a statesman who could do or suffer "nothing base," and who had the rare power of transfusing his own indomitable energy and courage into all who served under him. "A spirited foreign policy" has always been popular in England, and Pitt was the most popular of English ministers, because he was the most successful exponent of such a policy. In domestic affairs his influence was small and almost entirely indirect. He himself confessed his unfitness for dealing with questions of finance. The commercial prosperity that was produced by his war policy was in a great part delusive, as prosperity so produced must always be, though it had permanent effects of the highest moment in the rise of such centres of industry as Glasgow. This, however, was a remote result which he could have neither intended nor foreseen. Lady Hester Pitt (October 19, 1755 - July 20, 1780), who married Viscount Mahon, later the 3rd Earl Stanhope, on December 19, 1774; three children. John Pitt, 2nd Earl of Chatham (1756-1835), who married The Hon. Mary Townshend; no issue. William Pitt the Younger (May 28, 1759 – January 23, 1806), who also served as Prime Minister; he never married. Lady Harriet Pitt (bef. 1770-1786), who married The Hon. Edward James Eliot, oldest son of the 1st Baron Eliot, in 1785; one child. The correspondence of Lord Chatham, in four volumes, was published in 1838–1840; and a volume of his letters to Lord Camelford in 1804. ↑ Horace Walpole. Memoirs of the Reign of King George II: Volume III. (New Haven, CT: Yale University Press, 1985. ISBN 9780300031973), 1. ↑ Horace Walpole. Memoirs: Volume II. p. 251. ↑ Jeremy Black. Pitt the Elder. (Cambridge University Press, 1992), 299. Ayling, Stanley Edward. The Elder Pitt, Earl of Chatham. New York: D. McKay, 1976. ISBN 9780679507178. Black, Jeremy. Pitt the Elder. British lives. Cambridge [England]: Cambridge University Press, 1992. ISBN 9780521391160. Chisholm, Hugh. "Chatham, Earl of" entry The Encyclopædia Britannica: A Dictionary of Arts, Sciences, Literature and General Information, 11th ed., London: University press, 1910. Hotblack, Kate. Chatham's Colonial Policy; A Study in the Fiscal and Economic Implications of the Colonial Policy of the Elder Pitt. London: G. Routledge & Sons, 1917. Peters, Marie. The Elder Pitt. London: Longman, 1998. ISBN 9780582259584. Walpole, Horace. The State papers domestic for years 1727-1960 of the reign of George II. Brighton, Sussex, England: Harvester Press, 1980. Williams, Basil. The Whig Supremacy, 1714-1760. Oxford: Oxford University Press, 2000. ISBN 978-0198217107. Speeches of William Pitt, 1st Earl of Chatham. History of "William Pitt, 1st Earl of Chatham"
This page was last modified on 4 May 2015, at 15:26.